I‘m afraid this is another memory of how I have been a captive of my sweet tooth from as early as I can remember. 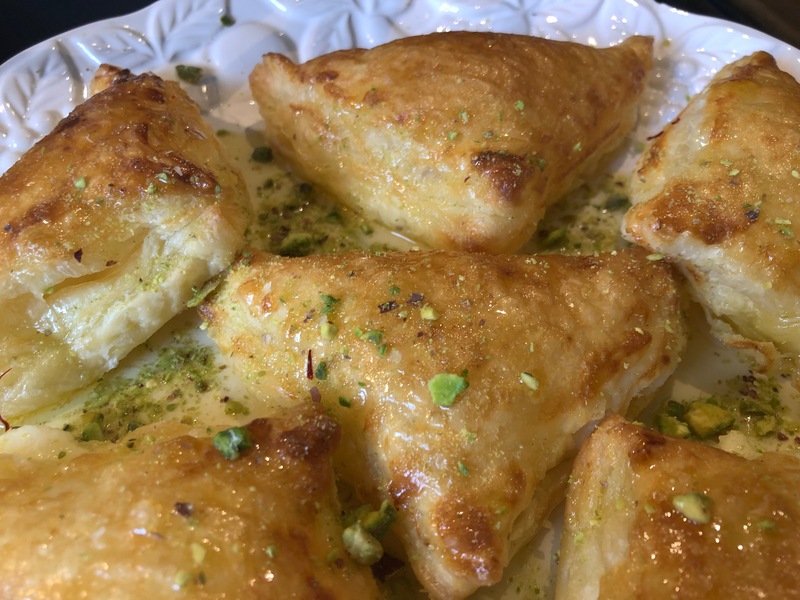 For all its noise and chaos, Beirut has always been a temptress to those who are weak when it comes to syrupy, sugary indulgence. I remember just as the war was starting in the mid 1970s, my hardworking and hard-pressed parents used to deposit my sister and me during the school holidays with my formidable grandma on my father’s side, Oum Mounir, in Zaroub Altamlees. 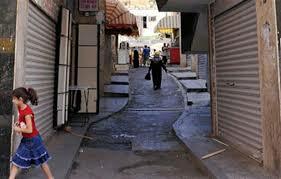 The area was one of the poorest in the city at the time. It was known as a den of drugs and prostitution. It still has problems to this day. Incidentally, it was where I was born and spent my first year. My father managed to navigate his way up from there. My grandmother was extremely strict, with reams of rules and an obsession with cleanliness – like all the women in my family, I confess. We never wanted to stay with her but the chance to play with our cousins and mix with friends rougher than my parents would permit made it a little more bearable. My earliest memories of Oum Mounir are of spending long, long afternoons on her patio, while she watered her intensely looked after Arabian Jasmine pots -فل . The smell was overpowering from the tiny white flowers known as Grand Duke of Tuscany. Then she would start the sisyphean task of cleaning and brushing her precious scrap of Eden. Until the regular streetseller in his rackety old van would shatter her idyll with his raucous squawking through the loud speaker vaunting the glories of his sheibeyat – شعيبيات. We would immediately rush to my grandmother and start begging her to buy us some. But she knew very well that we were spoilt kids who would never touch food from a van – and was suspicious of what we were up to. So we had to whine and cajole until she relented on her rules for a moment and let us go and buy some. We raced out of the flat. We headed straight to the van and got our crumpled lira out to buy the pudding. But we would take only a bite and leave the rest. It is a messy business eating Sheibeyat and we really only wanted to shut the street seller up; his ugly shrieking made us shudder. He would repeat the same cry over and over again, شعيبياتنا صخنين وطيبين كبرو الجاطات لنكترلكن القطرات . The pudding, however tempting, wasn’t the real reason we were so eager to go out — it was simply our most plausible escape route. One of my grandma’s strictest rules was never to go out of the door, never to talk to anyone and definitely never to play with any of the kids in that god forsaken place, tucked behind the Abdulnasser mosque in AlMazraa. That’s despite the fact that nine of my uncles were brought up in that two bedroom flat, with its big blank ceilings and black and white tiles. Across the way was a tin shack where a family even worse off lived — one of my uncles ended up marrying one of the girls from there, despite his family’s efforts to stop him. 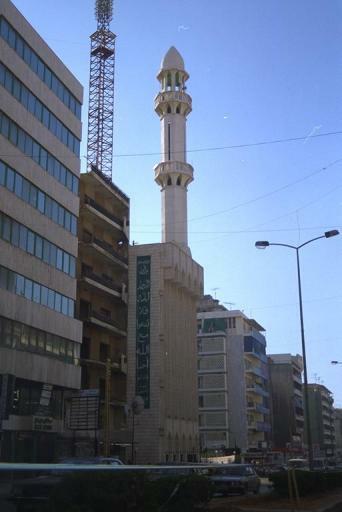 Above the neighbourhood was the hill of Zureik – or orphans – named after the Islamic orphanage there. Once out of her control and in the street, we always flagrantly broke my grandmother’s rules and ran wild on the sandy hill with the local kids — seen by my family as too rough for us — as well as a few of our cousins. We’d play hide and seek, catch and other games — a huge release for two girls who were so often locked in a small apartment. We would come back dusty and dishevelled, nursing our bruises, but happy that we’d once again successfully made our escape if only for a little while. Despite my love of sweet things, the sheibeyat was really just a ploy and an afterthought. I don’t think I ever really tasted it properly back then — too excited by the prospect of freedom on the orphans’ hill. 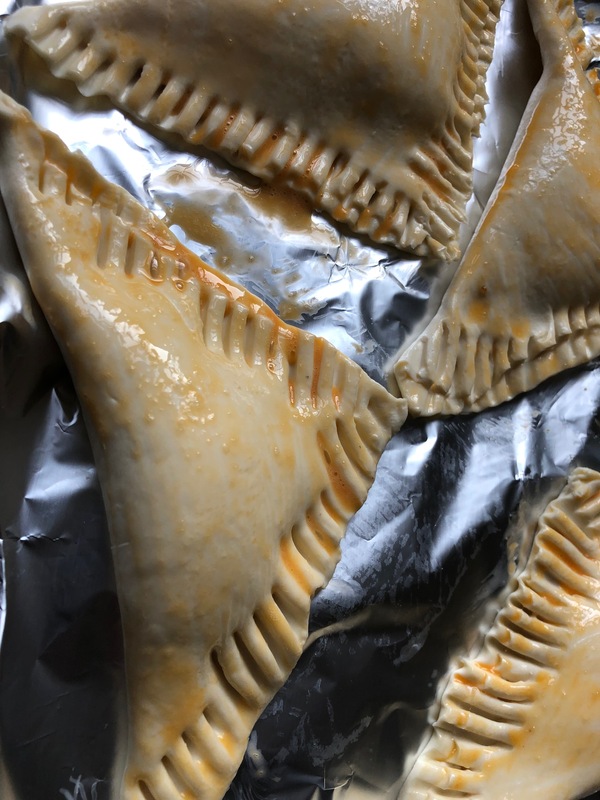 Remove the puff pastry from the packet and leave at room temperature. Put the rest of the filling ingredients in a non stick pan, stir well then put on the hob on medium temperature. Keep stirring until the cream thickens. This will take around 10-15 minutes,add more starch if necessary. Remove the pot from the hob and leave to cool down. In a small non stick pot put all the syrup’s ingredients and stir well. Put the pot on the hob on high temperature and keep stirring until the sugar dissolves When the syrup starts to boil, reduce temperature and leave to simmer for 25-30 minutes or until the saffron syrup is a bit thick. 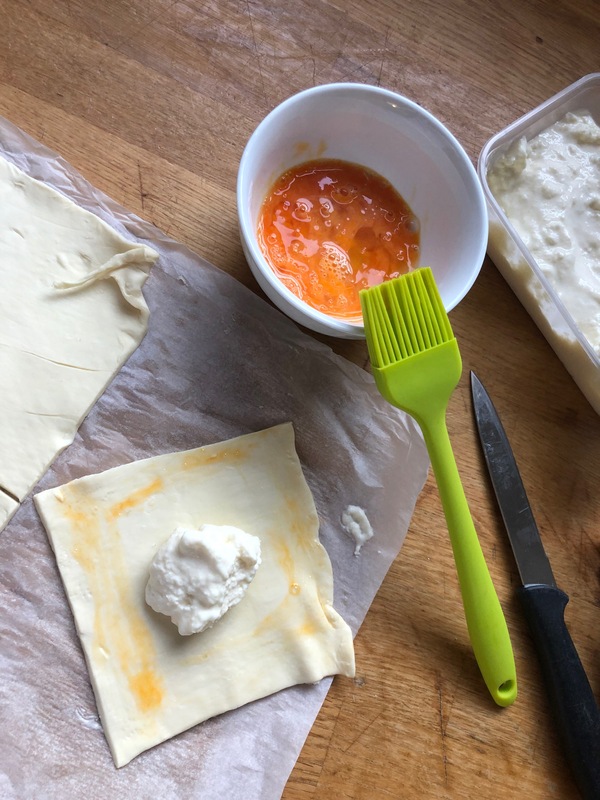 Cut the puff pastry into squares, around 8cm x 8cm. It will make around 16 squares. Fill each square in the middle with one spoonful of the cooked cream. In a small bowl, beat 1 egg, add the milk and whisk well. Brush the edges of the pastry with the egg mixture. 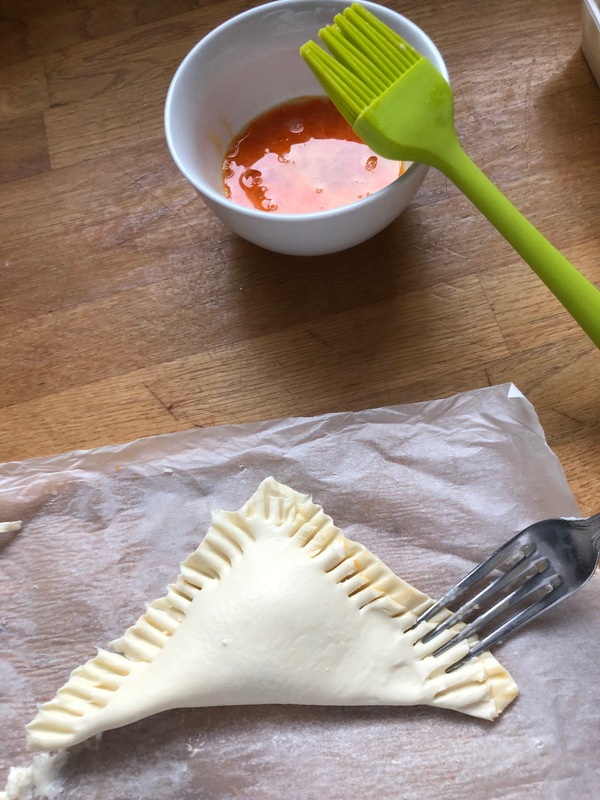 Fold the pastry over the filling to form a triangle. Crimp the edges with a fork to seal. 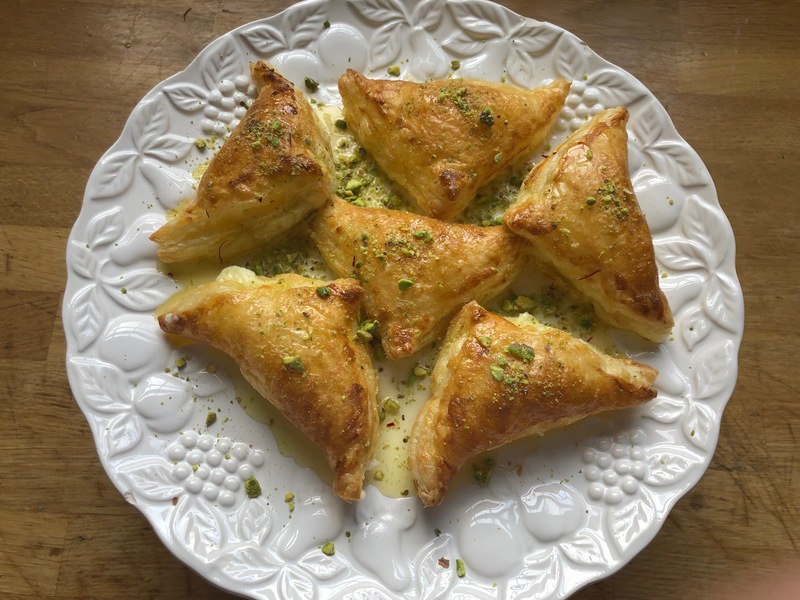 Place the filled pastries onto a baking tray and brush each triangle with the egg mixture. Put the tray in a pre heated oven 200 degree, on the middle shelf. Bake for 15-25 minutes or until the pastries are golden brown. Remove from oven and pour the saffron syrup on top immediately. 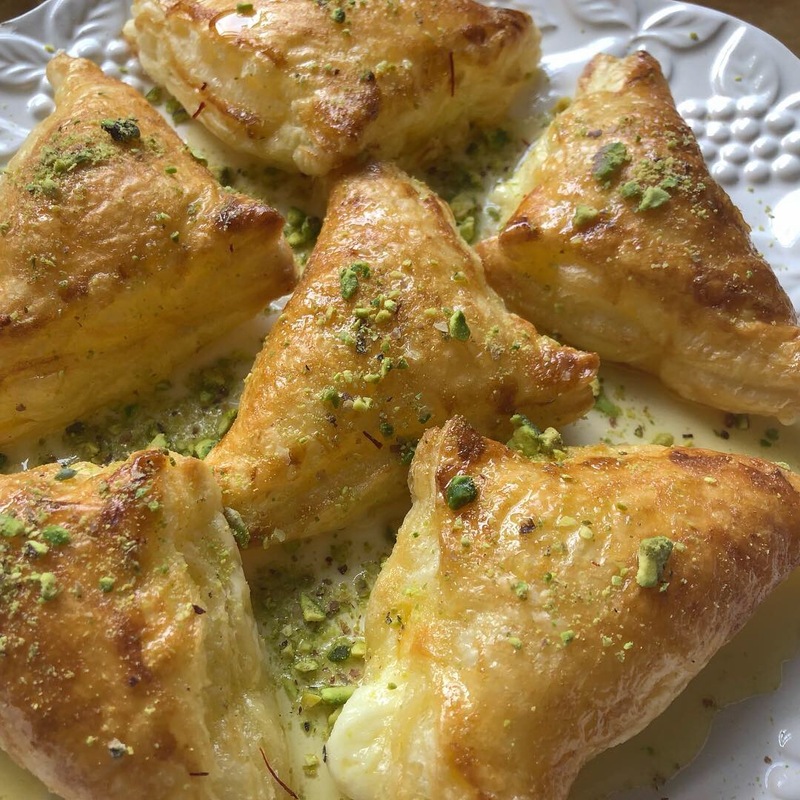 Sprinkle the pastries with ground pistachio nuts and leave to cool before serving.